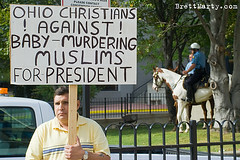 Image by permanently scatterbrained via FlickrHow do you tell a good Muslim from an evil Muslim? No, this isn't poor ethnic humor; it's the subject of an Oct. 24 FrontPage Magazine article called The Nine Signs. Yes, it's a litmus test for who's been naughty and who's been nice. But perhaps the interview subject, Dave Holly of the United American Committee, wasn't expecting AltMuslim.com to turn the signs on their head, and apply them to extremist Christians. Read the article Through The Looking Glass: Nine Danger Signs Of Militant Islam by Sheila Musaji, which points out that some Christians can be just as wacky as some Muslims. Ain't no monopoly on nuts.